This property is 1 minute walk from the beach. 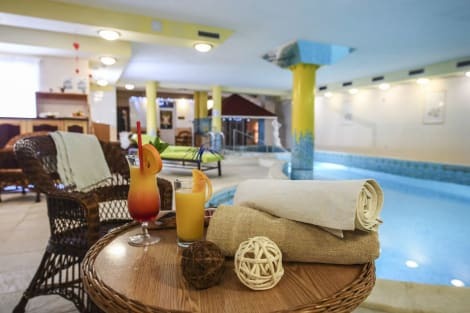 Hunguest Hotel Flora is located in the centre of Eger, opposite the formal Turkish Baths and the mineral springs. It features a restaurant, a bar and offers medical and spa treatments. Free WiFi is available throughout the property. All rooms come with a TV and a bathroom with shower or a bath. Most of the rooms have a balcony. The wellness area offers a sauna, solarium, a steam room, a hot tub, a Kneipp-pool and several adventure pools. Guests can play darts and billiards at Hunguest Hotel Flora. Private parking is possible on site for an additional fee. The Hunguest Hotel Flora is a 10-minute walk away from the center and the Castle of Eger. With a stay at Hotel Unicornis in Eger, you'll be within a 10-minute walk of Eger Lyceum and Kopcsik Marzipan Museum. This hotel is 0.5 mi (0.8 km) from Eger Cathedral and 1.4 mi (2.3 km) from Eger Minaret. With a stay at Hotel Korona Eger in Eger, you'll be within a 10-minute walk of Eger Lyceum and Eger Minaret. This 4-star hotel is 1.2 mi (1.9 km) from Kopcsik Marzipan Museum and 1.2 mi (1.9 km) from Eger Castle. Located 1.2 km from the town centre of Eger, Hotel Villa Völgy enjoys a quiet location in the Szépasszony valley. It offers a spa and wellness area, renovated and expanded in April 2014, a fitness centre and rooms with minibar and cable TV. Free Wi-Fi is available in the public areas. Guests of the Villa Völgy can enjoy breakfast buffet in the on-site restaurant or a drink in the bar. There, also a wide range of highly rated wines from the Eger wine region is served. Villa Völgy is surrounded by a 20.000 m² garden and features amongst others indoor and outdoor swimming pools, a hot tub, several saunas and a gym. Massages will be provided upon request. Guests can rent bicycles at the property for a surcharge. This comfortable hotel is situated in Heves Megye. The property consists of 210 bedrooms. Travellers will not be bothered during their stay, as this is not a pet-friendly accommodation. lastminute.com has a fantastic range of hotels in Eger, with everything from cheap hotels to luxurious five star accommodation available. We like to live up to our last minute name so remember you can book any one of our excellent Eger hotels up until midnight and stay the same night.